Democracy, many of us would like to believe, is good because it offers voters choice. It's the best possible way to regulate the replacement of a government by a process in which voters are presumably the kingmakers who choose from the policy menu. Ideally, democracy should force political parties to compete in the formulation of the best possible policy positions. If the ideal was also the reality, our political parties would boast huge departments of research and policy innovations. They would hire the best experts to come up with the best policy solutions. Voters would also develop expertise to make judgement calls on best policy options. Alas, in place of the best policy options for voters, we have competition for populist rhetoric. And voters seem to love the whole trickery. The more emotionally appealing your rhetoric, regardless of whether it is anchored on sound policy, the more likely you can earn your seat in Parliament. Even the parties that have a semblance of good policies don't speak about those policies when they campaign for votes. Experts are hired not to develop policy solutions, but to develop public relations strategies to hypnotise voters. When talking to voters, it would seem the race to the bottom is the most preferred. This is not a uniquely South African problem. The rise of right-wing populists in Europe and the United States is primarily the result of this kind of emotionally charged rhetoric-based politics. While some developed countries might have room to play with rhetoric, South Africa doesn't. We need serious policy-driven solutions, mechanisms to implement them and reasonably honest politicians and voters. The land reform debate offers potential for adopting innovative policy measures to correct the injustices of the past and simultaneously inspire investor confidence in the economy. But the debate is being hobbled by the short-term need for politicians to garner votes. The potential benefits of democracy are undermined by populist short-term calculations towards the 2019 elections. Take for example the ANC conference's decision to resolve to expropriate land without compensation with the caveat that it should not affect food security and other sectors of the economy. Since its formation, the ANC never advocated for outright expropriation of land. The ANC, however, had good ideas that, if implemented, would have fundamentally changed the land ownership landscape in South Africa. Land hoarding would have been taxed. Black farmers who benefitted from redistribution would have been assisted to reach full production capacity. They would have been assisted to gain access to markets. And aspirant black agri-industry players would have received state-of-the-art training in vibrant agricultural colleges. Instead of implementing these ideas, the comrades in power had other priorities – including instant gratification for themselves. 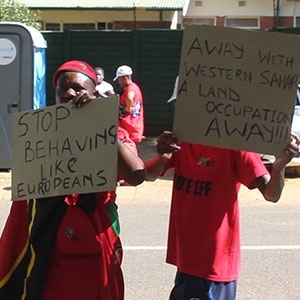 In the context of political competition for votes, the new political party, the Economic Freedom Fighters, emerged to advocate for expropriation of land without compensation. All land, the party said, should belong to the State. It seems this policy position was winning EFF voter support especially among the understandably disgruntled and unemployed. Not to be outdone, the ANC had to adopt a resolution along the lines of the EFF but polished with conditions. This cat-and-mouse political competition for votes between the two parties didn't end there. It is becoming a tragicomedy of sort. The battle for rural voters under the jurisdiction of unelected chiefs is forcing the two parties to alter their positions. Last week the EFF held a joint press conference with leaders of the Congress of Traditional Leaders of SA (Contralesa). They claimed to have agreed on a wide range of issues including the need to nationalise land. Interestingly, in their joint statement, the two organisations said they had agreed that, "land which currently falls under the custodianship of traditional leaders will continue to be held as such but subject to the primary and overall trusteeship of the state on behalf of the people." Coming from the EFF this policy position is not only new; it contradicts the party's original policy. The EFF has to make a clear policy decision. Either it promotes expropriation of all land without compensation or it doesn't. Well, there is the matter of gaining votes. Policy muddling under the circumstances works. It won't be long before we hear slogans like "hands off our chiefs!" especially where traditional leaders are perceived to have influence over the sentiment of voters. Unsurprisingly, the EFF's joint statement with Contralesa also refers to the need to tread carefully behind the scenes when dealing with the controversial Ingonyama Trust led by Zulu King Goodwill Zwelithini. "We jointly disagree with an approach that seeks to conduct that debate [about the fate of the Ingonyama Trust] in the media, serving to entrench positions and will surely retard progress and only fuel unnecessary tensions," the statement reads. "We are all confident that this issue will be resolved through honest debates; there is no other alternative." Isn't the land reform debate in South Africa a public matter? But, somehow, the Ingonyama Trust's issue must be discussed privately! Not to be left behind in the political genuflection on the feet of Zwelithini, President Cyril Ramaphosa has also appeased the king, assuring him his government won't touch land under the Ingonyama Trust. This is the third exclusion on the land that could potentially be expropriated. The first exclusion was that by implication, land that serves as collateral for bank loans won't be expropriated because it would affect other sectors of the economy. The second exclusion, also by implication, was that land that is productive will not be expropriated without compensation as there was the national imperative for food security. In just one public pronouncement, Ramaphosa vowed to leave untouched land under the control of chiefs. So, people who live on tribal land will never have title over the land. They will remain subjects, not full citizens. Doesn't all this make the land reform debate a farce? On the positive side, however, political competition between the DA and the ANC on the land question seems to be yielding some positive results. Since the DA began popularising the idea of giving people title deeds for townships homes, starting in Cape Town when Patricia de Lille was still the party's mayoral darling, the ANC also has been making moves in that direction. Political competition that gives Africans asset ownership is really progressive. Unfortunately, this type of competition is overwhelmed by the race to the bottom we currently are witnessing on the issue of communal land.